Every year it seems, there is at least one prestigious historical costume drama released around this time of year hoping to rack up lots of Oscar nominations. 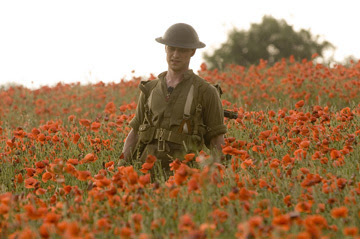 This year, that film is Atonement, which thankfully does not fall victim to the Cold Mountain syndrome (which was just as cold and distant as its title suggested), and is every bit as emotionally affecting as it is visually sweeping. Directed by Joe Wright, who burst onto the scene in 2005 with his enrapturing adaptation of Jane Austen's classic Pride & Prejudice, Atonement (based on the novel by Ian McEwan) is a wholly different animal, and yet cut from the same cloth as its predecessor. Pride & Prejudice was an uplifting romance, the kind that sent you soaring out of the theater with your heart aflutter. Atonement is a tragedy of decisions, consequences, and a lifelong quest for redemption that bears some thematic similarities to another year-end adaptation of a prestigious novel, The Kite Runner, except it is far more adept at achieving its goals. 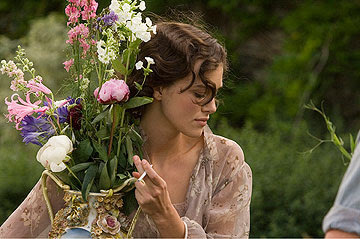 On the surface, the film appears to be a love story between Cecilia Tallis (Keira Knightley) and Robbie Turner (James McAvoy), an upper class woman and her gardener's son against the sweeping backdrop of WWII, but the story really belongs to Cecilia's younger sister Briony (Saorise Ronan; later Romola Garai and Vanessa Redgrave), an imaginative aspiring writer who, at the age of 12 years old, witnesses something she doesn't understand and makes a false accusation that tears Cecilia and Robbie apart and sees them separated as the second world war wreaks havoc on the world around them. Briony's is the atonement of the title - a lifelong quest to somehow make up for what she did and the lives she destroyed. Wright hauntingly and deftly weaves a life's worth of guilt and shame to illustrate the devastating ramifications of one bad decision made by a naive little girl; and it is all beautifully captured by cinematographer Seamus McGarvey, showcasing a breathtaking five and a half minute tracking shot of the beach at Dunkirk, where ragged and ghostly British soldiers have retreated from the German onslaught. That moment is one of the year's defining set-pieces, creating an eerily beautiful sense of disorientation and despair in war. The film also boasts a superb score by Dario Marianelli, who uses ingenious instrumentations to add greater depth to the characters, especially in his use of rhythmic, pounding typewriter keys to represent Briony, and his blending of score and a choir of soldiers singing on the beach in the Dunkirk scene that really adds up for one of the best scenes of the year. If nothing else in the film was worth watching (which it thankfully is), the film would still be worthy of recognition for that scene alone. It is one of the most powerful and perfect marriages of direction, sound, music, performance, and mise-en-scene of the decade. My only real problem with Atonement is that it tends to skimp and skim, especially in the latter part of the middle stretch, hurrying through certain points and taking its time with others. But by the time the film reaches its heartbreaking denouement, featuring the luminous Vanessa Redgrave as an elderly Briony, the movie reels us back in and reminds us why it captured us in the first place. It is a beautiful tragedy - a deeply moving examination of the ripple effect of decisions and how the affect our lives. It is a refreshingly old fashioned romantic epic that truly delivers on its promise to dazzle the eyes and break the heart. Thanks for the interesting review! One thing: the Redgrave who made a stupendous late-film showing in KINSEY was Vanessa's gifted sister Lynn. Wow...my memory really is failing me. Thanks for the correction...it's been a very long time since I saw "Kinsey."